Since his stage debut in 1974, New Zealand playwright Dean Parker, who last year was awarded the inaugural Playmarket award for making a a significant artistic contribution to theatre in New Zealand, has been a consistent voice from the left worldview. His last work staged in Auckland was The Hollow Men in 2008, the farcical doco-theatre adaption of Nicky Hager’s political study into the Brash years of the National Party. 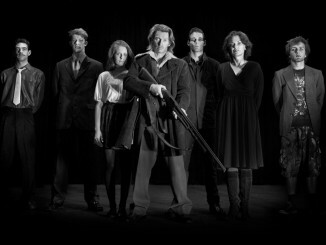 Midnight in Moscow represents the first time Auckland Theatre Company has programmed one of Parker’s works. 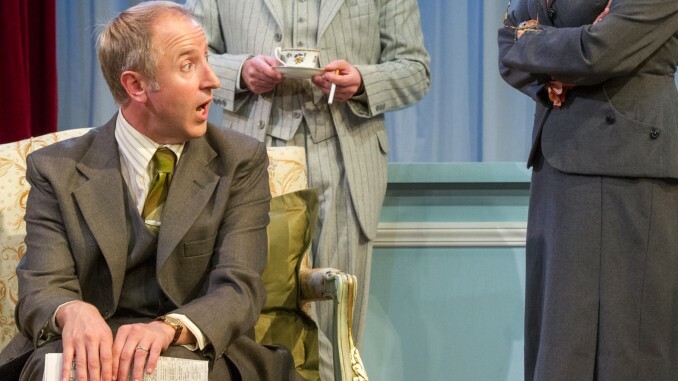 The smoky Russian locale and intrigue of spies and lies, with a mole suspected within the New Zealand embassy in 1947, have been emphasized in this production and are appealing. But more than this, the play is a cerebral treatise on one of the most significant forces of the 20th Century: Communism, and its corruption. The immediate impression of the New Zealand embassy in Moscow is akin to a Gliding On for diplomats. Head of Mission June Temm’s (Robyn Malcolm) immediate problem is a dealing to a hangover. Her outwardly naïve niece Madeline (Sophie Hambleton) flirts incessantly with Kit Lovell-Smith (Carl Bland), prone to bursts of boisterous song, whose homosexuality is an open secret. We also meet the husband and wife team of the temperate Sophie (Hera Dunleavy) and writer Hugh Toomey (Adam Gardiner). The set-up seems to be small fish New Zealanders trying to be important in a much larger ocean. There’s early excitement at the prospect of the “colony” being allowed into the British Council’s production of Gilbert and Sullivan’s The Mikado (whose depiction of the exotic orient finds echo in the socialist fantasy of Russia). This is the appearance. But an opening monologue from Bland, concerning the fiction of E.M Forster, and the meta-theatrical concepts of players and roles, clues us to keep an active watch. When June is summoned by the Americans and learns that leaked documents have been linked to the New Zealanders, suspicion falls on each one of the small embassy team. There are “red” herrings along the way, although dramatically the culprit can be easily deduced. It is not so much the who, that is important, as to the why. Moscow is a play of deep ideas and ideology, presented in a lighter-hearted form. This is partly in the design of Parker’s script. 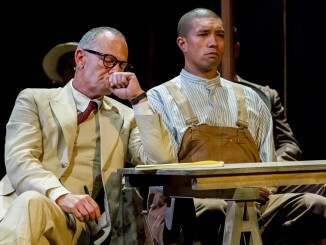 Parker describes the play as “an imaginary entertainment, a dramatic fiction” which takes advantage of the “odd real-life” event. Scenes end in dramatic punch-lines – including a faint – which combined with a pulsing piano tune during set changes – give us shades of melodrama. McColl’s production goes further. The casting of regular ATC performer Adam Gardiner is pivotal here. While his character of Hugh Toomey – with his literary angst and deeply held alternative political convictions – has the makings of a classic tragic hero, Gardiner instead displays his usual flair for the ridiculous, finding a brash Hugh full of hot air. A rich subplot in the play concerns his relationship with Boris Pasternak (Phil Grieve), famed Russian writer and poet of Doctor Zhivago fame (published in 1957 when he was smuggled out of Russia), and in turn Hugh’s relationship with Boris’ mistress Olga Ivinskaya (Elena Stejko). Told over food and drink, Boris and Hugh’s scene is a comic joy, cricket-mad Hugh confusing his host, and then teaching him a song from his New Zealand childhood. But we also catch something else: a palpable anxiety about where Russia is heading under Stalinism. Poet Pasternak awaits the inevitable phone call from the political establishment. The device of the light veneer is one that generally works; an appealing opiate to the bourgeoisie audience of the ATC. But there’s an imbalance caused in Parker keeping most of the powder dry until a final monologuic explosion at play’s end. It’s a powerful union of writing and performance as a character examines their life choices, thwarted ambition, and what it was all for. The struggle captures the death of the communist dream itself, history and humanity twisting and corrupting the ideology. The off-stage story of Moscow has been a dramatic one, as McColl observes in the program, “after the unfortunate fire at the Maidment Theatre it looked like an Auckland season of the play might never happen!”. The EDGE was able to come to the party, and the Lower NZI in the Aotea Centre has been converted into an adequate Studio theatre. Sightlines are a poor cousin to the Maidment, and other audience’s heads get in the way, but Moscow is a play to listen to as much as watch. John Parker’s practically minded set has apparently been preserved, a revolving stage well utilized to suggest the embassy interior and Russian country side. A wall of curtains (with a highlight of Russian red), heightened by the delicate light design of Philip Dexter, suggest the schematic concern with what is hidden. Nic Simillie’s costume designs ably communicate time and place. Marx himself said that history repeats itself twice: first as tragedy, then as a farce. The play’s “traitor” would have us see it as a tragedy. The production style emphasizes the farce. Certainly both are options in approaching Moscow. Which label best suits this particular historical-fiction might depend entirely on your politics. 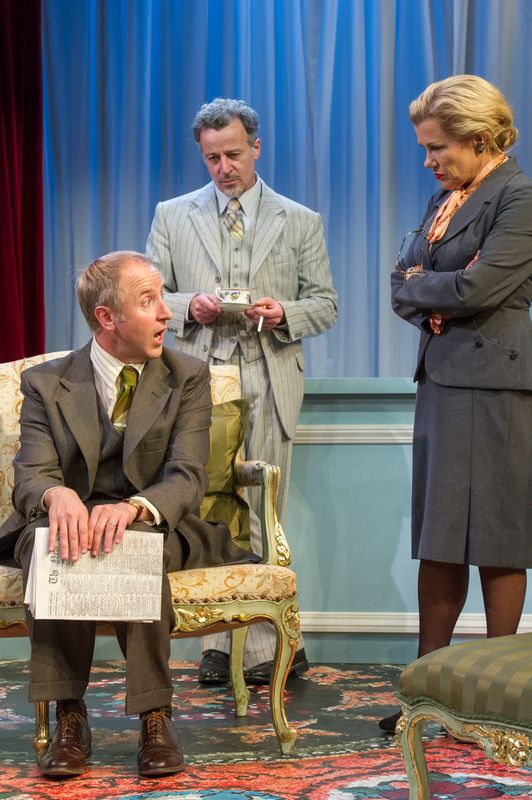 Midnight in Moscow is presented by Auckland Theatre Company and plays at the Lower NZI, Aotea Centre until 4 May. Details see ATC.